Start off your visit on the 5th (Sun): glide through natural beauty at Cherry Creek State Park and then take in the dramatic natural features at Roxborough State Park. Here are some ideas for day two: take a stroll through 16th Street Mall, then get a new perspective on things with Boat Tours & Water Sports, and then look for all kinds of wild species at Dinosaur Ridge. To see maps, where to stay, more things to do, and other tourist information, read our Denver vacation maker . Louisville to Denver is an approximately 5.5-hour flight. You can also drive; or take a bus. Due to the time zone difference, you'll gain 2 hours traveling from Louisville to Denver. In May, Denver is slightly colder than Louisville - with highs of 66°F and lows of 43°F. Finish your sightseeing early on the 6th (Mon) to allow enough time to travel to Moab. Step out of the city life by going to Canyoning & Rappelling Tours and Turret Arch. You'll discover tucked-away gems like Adrenaline & Extreme Tours and Park Avenue Trail. The adventure continues: grab your bike and head to Slickrock Bike Trail, examine the collection at Moab Museum of Film and Western Heritage, and take a memorable drive along Colorado Riverway Recreation Area. To see ratings, where to stay, and more tourist information, refer to the Moab trip app . Traveling by flight from Denver to Moab takes 4.5 hours. Alternatively, you can do a combination of flight and car; or drive. Traveling from Denver in May, expect Moab to be somewhat warmer, temps between 76°F and 49°F. Finish your sightseeing early on the 9th (Thu) so you can drive to Grand Canyon National Park. 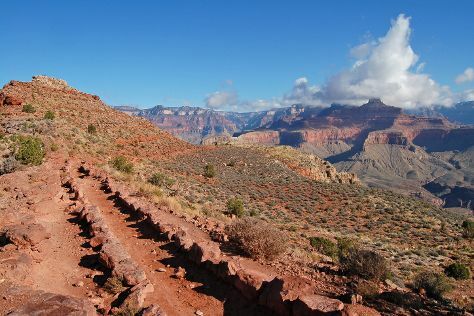 Start off your visit on the 10th (Fri): trek along South Kaibab Trail, then take some stellar pictures from Yaki Point, and then take in breathtaking views at Grand Canyon South Rim. Get ready for a full day of sightseeing on the 11th (Sat): pause for some photo ops at Powell Point, tour the pleasant surroundings at Rim Trail, and then take in breathtaking views at Yavapai Point. To find photos, maps, reviews, and other tourist information, go to the Grand Canyon National Park trip itinerary app . You can drive from Moab to Grand Canyon National Park in 5.5 hours. Expect a bit cooler temperatures when traveling from Moab in May; daily highs in Grand Canyon National Park reach 68°F and lows reach 33°F. Finish your sightseeing early on the 11th (Sat) so you can travel to Las Vegas. Start off your visit on the 12th (Sun): see the interesting displays at The Mob Museum, then get a taste of the local shopping with The Strip, and then make a trip to Bellagio Fountains. 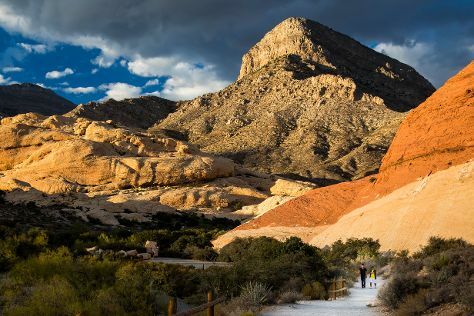 On the 13th (Mon), you'll have a packed day of sightseeing: take a stroll through The LINQ Promenade, have fun at The Little Vegas Chapel, and then explore the stunning scenery at Red Rock Canyon National Conservation Area. To find traveler tips, where to stay, other places to visit, and more tourist information, go to the Las Vegas tour planner . Traveling by combination of flight and car from Grand Canyon National Park to Las Vegas takes 4.5 hours. Alternatively, you can drive; or take a shuttle. Due to the time zone difference, you'll gain 1 hour traveling from Grand Canyon National Park to Las Vegas. Traveling from Grand Canyon National Park in May, you will find days in Las Vegas are a bit warmer (87°F), and nights are warmer (64°F). Finish up your sightseeing early on the 13th (Mon) so you can go by car to Death Valley National Park. Kick off your visit on the 14th (Tue): go deep underground at Eureka Mine, explore the stunning scenery at Twenty Mule Team Canyon, and then take in breathtaking views at Mosaic Canyon. Get ready for a full day of sightseeing on the 15th (Wed): don't miss a visit to Ashford Mill Ruins, then Head underground at Titus Canyon, then contemplate the long history of Harmony Borax Works, and finally get engrossed in the history at The Ranch at Furnace Creek. To find where to stay, more things to do, and tourist information, you can read our Death Valley National Park trip planner. Getting from Las Vegas to Death Valley National Park by car takes about 2.5 hours. Other options: take a bus. Plan for little chillier nights when traveling from Las Vegas in May since evenings lows in Death Valley National Park dip to 55°F. Finish your sightseeing early on the 16th (Thu) so you can drive to Los Angeles. Kick off your visit on the 16th (Thu): get in on the family fun at Disneyland Park. On the 17th (Fri), you'll have a packed day of sightseeing: stroll the grounds of Hollywood Forever Cemetery, then appreciate the extensive heritage of Hollywood Walk of Fame, and then look for all kinds of wild species at Running Horse Ranch. For more things to do, ratings, and tourist information, go to the Los Angeles tour itinerary planning app . Traveling by car from Death Valley National Park to Los Angeles takes 4.5 hours. Alternatively, you can do a combination of car, bus, and train; or do a combination of bus and flight. Expect slightly colder weather when traveling from Death Valley National Park in May: highs in Los Angeles hover around 75°F, while lows dip to 59°F. Finish up your sightseeing early on the 18th (Sat) so you can travel back home.